The commercial applications of the technology range from de-icing of commercial airplanes and large trucks, to rust and corrosion prevention of exposed metal surfaces, to cleaner, anti-microbial surfaces for surgical and medical facilities. But to make the technology commercially viable, the lasers must become much more powerful. A venture capital-backed technology company, FemtoRoc Corp., is undertaking a joint research project with John Marciante, an associate professor of optics, and the University's Institute of Optics to develop those more powerful lasers. The project, expected to take six years, has a research budget estimated at $10 million. "What they [FemtoRoc] need is a high-powered, ultra-fast, femtosecond-class laser system with average power measured in kilowatts, rather than the 10's of watts now commercially available," says Marciante. "So, we need to scale up by over a factor of 10." "It's a very ambitious undertaking." The proprietary, super-hydrophobic technology uses lasers to create an intricate pattern of micro and nanoscale structures, giving the treated metal surfaces a new set of physical properties. In 2015, Chunlei Guo, a professor of optics, and Anatoliy Vorobyev, a senior scientist at the Institute of Optics, described the extremely powerful, but ultra-short laser pulses they used to permanently change the surface of metals. Guo and Vorobyev have successfully used this technique to create not only metal surfaces that are extremely water repellent, but ones that attract water as well. Guo's laboratory has also created a process to treat metal surfaces to absorb virtually all wavelengths of ambient light and which has a wide array of commercial applications, including thin, ultra-efficient solar cells. However, it takes about an hour for Guo's laboratory to pattern a 1-inch-by-1-inch metal sample using commercially available, low-powered lasers. 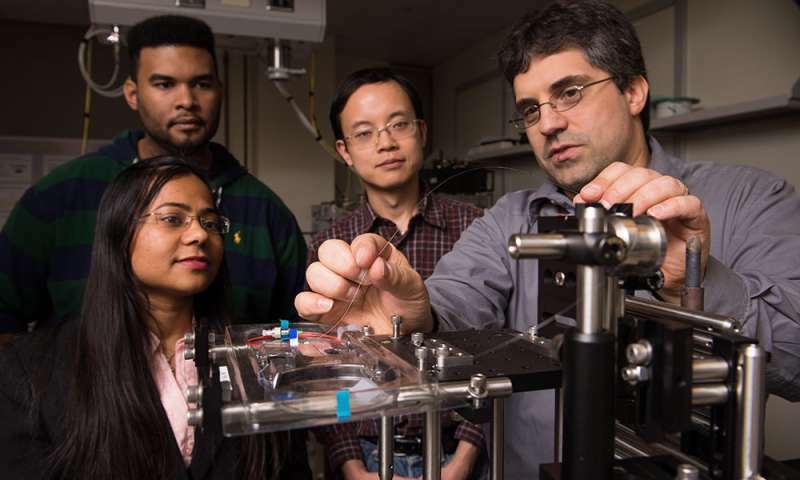 More powerful, ultra-fast femtosecond laser pulses are needed to speed up the process to make the technology commercially viable. To develop the lasers, Marciante's laboratory, which specializes in developing advanced, high-power, fiber lasers, will need to address two main challenges. One is that laser beams are usually confined in conventionally designed optical fibers, which tend to be very small in core diameter. In scaling up the laser power, too much light becomes concentrated in the fiber's core, and nonlinear properties proliferate, causing the laser beam to broaden or become modulated. "When you try to compress the beam to a short pulse, there's a lot of energy that doesn't fit in that pulse," Marciante explains. "The usable power spreads out, or does not focus where you want it to." The second challenge is overheating. "You're pumping the laser beam at one energy level, at one end, and then extracting it at a lower energy level, at the other end, and no process is 100 percent thermally efficient. So that extra energy ends up in the fiber. The fiber can get very hot, even to the point of melting," Marciante says. In addition to the research done by his own team, Marciante will leverage a network of veteran researchers in the United States and abroad and bring in third party vendors with proven fiber design and manufacturing capabilities. a way to greatly reduce the effects of nonlinearities in the core of the proprietary fiber. "In principal, if you cut fiber length in half, you can go to twice as much energy," Marciante says. "The tradeoff is, you're also dumping the heat into half as much space." "It's a very exciting challenge," Marciante says. "No one in the world has been able to do this specific kind of femtosecond laser treatment of metal surfaces," he adds. "To launch commercial products using this technology will be a real game changer. This is a once-in-a-lifetime opportunity to create new science."